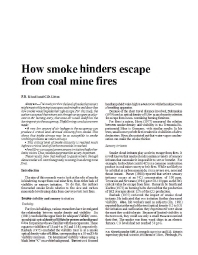 This study predicts the level of smoke that miners might meet while trying to escape a coal mine fire and describes how smoke would impede their safe escape. For this study, the authors assumed that miners exit through an escapeway adjacent to the burning entry, and that some air would leak from the burning entry to the escapeway. The following conclusions were made: A very low amount of air leakage to the escapeway can produce a critical level of visual obscurity from smoke. This shows that intake airways may be as susceptible to smoke visibility as return airways; This critical level of smoke obscurity is reached much before a critical level of carbon monoxide is reached; Small fires can cause a severe sensory irritation that further limits vision. Thus, reliable eye protection is very important. These results show that methods to guide miners through dense smoke will contribute greatly to saving lives during mine fires.